Zoltan Bathory spoke to Metal Hammer about his 10 Five Finger Death Punch favorite songs of all time. "This was the song that opened the door for us. 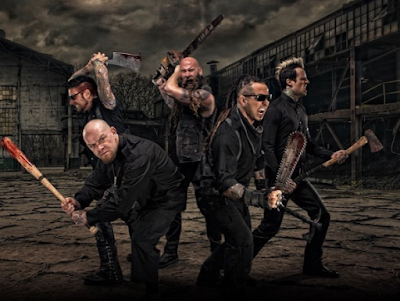 People told us that a band with a stupid name like Five Finger Death Punch playing this kind of heavy music would never be on the radio, but this song got on the radio and it became a top ten hit. It opened doors for us and it’s the last song we play at every show. I had this riff for a decade before we used it. It almost didn’t make the record because we thought it was too light for the record, but thank god we did it because without this song there would be no Five Finger Death Punch." "I love to play this song live and it’s a very important song for me. The percussive guitar playing – the way we play songs – it was different to the time, and it established a sound that now belongs to Five Finger Death Punch. It had a sound and a vibe that established what the band is and the direction we were going into. It was very percussive, fast metal or whatever we can name it, it was different to what was around us." "It’s my favourite song to play live. It has the right beat, the right groove, the right everything for a live performance. This song is in the encore when we come back and the first moment we play that riff I can feel the audience wake up and there’s a roar. It’s the perfect song and the perfect riff to play live. It’s really really fun to play." "This is our biggest single to date. I had this riff for a long, long time. I didn’t know what to do with it, but it came together and it became a very important song. It has a video that gives the song another meaning and a cultural impact because of the message. The song has such an impact that mainstream politicians had to address it, the Washington Post had to address the song because of the message that veterans around the world aren’t taken care of, and these guys need our respect." "Obviously it’s a pretty angry song, and another one that I really like because of the performance. It’s one where we pull the kids out from the crowd and get them onstage – that's a special moment in our live show. Again it’s really fun to play, everybody sings the words, and it’s a very impactful song live." "I really really like this song, it’s very personal to Ivan. When we were recording, it was the last song and didn’t get mixed on time, but it was on the deluxe edition of American Capitalist. This song has never really seen the light of day, but it’s one of our best songs in my opinion." "This was the first song we played in the set for a while, and another great song to play live – it gets a massive reaction. But most importantly it was the song where we had Rob Halford sing, which was an amazing and surreal moment for us. It was a historic moment for the band and in our lives, this is Rob Halford singing on a Five Finger Death Punch song. He always checks in on us, he always sends messages to see if we’re okay, he’s an amazing guy. When we asked him he said it would be an honour and he came to Las Vegas and recorded it there. Seeing him in the studio, you’re like a kid, he’s right here!" "This is more than just a song, it was an outreach and it’s always going to be relevant. There are so many people who are bullied, mistreated, suffering emotionally and mentally. Some of them want out and they’re contemplating possible suicide and some of them do kill themselves – this is an incredibly large problem. If you look at the statistics of how many people end their own lives, it’s astonishing. This song was an outreach, so many times you can save somebody’s life by being kind. If you see somebody is in trouble say something, intervene, just reach out, you might be saving somebody’s life. This video also had a massive reaction from people who are suffering from various issues and said this song saved their life. This justifies our existence. If you talk one person off the ledge, whatever you’ve done in your life, it’s been worth it." "This has a different tuning to other songs. I feel like it is a bit of a departure, but it fits in the repertoire. When Ivan has an idea at three of four o’clock in the morning he would call one of us and sing it to our answer machines – when he has an idea he gets really excited about it and wants to share it! It’s not about recording it, it’s about sharing the idea. Jason said his answering machine is set up, so even if he’s sleeping, just call the house and just sing. And that’s what happened. He called Jason in the middle of the night and sung it to his answer machine. It’s funny because Jason took the recording off the machine and wrote the song to the recording. What you hear on the record is straight from Jason’s answering machine, it wasn’t re-recorded, we kept what was there, the verses are straight from the machine." "Even though it’s a cover, this song is very important to us. We started to play this song live because during the first record the band was rapidly gaining fans and we became a headliner, but we only had one record so we didn’t have enough material to be a headliner so we added a couple of covers. We were playing this for a while and when going back to the studio for a second record, the fans were hoping we’d record it. It became our first platinum single, but most importantly, our interpreation and the video we recorded at military bases across the world put it in a different meaning. This song became something else and took on a different meaning. We have a massive military fanbase and this became their anthem, I hear all the time from military guys and veterans that this is the song they wake up to or the song they listen to before they go out and risk their lives. It became bigger than us."